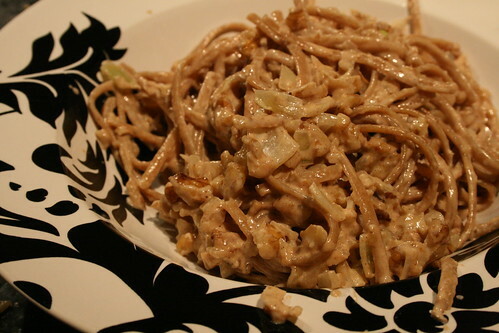 I picked this recipe because it looked very fast and easy to make, and because it involved pasta, heavy cream and walnuts. Which is funny, because I’m not the biggest fan of walnuts. They’re growing on me, particularly mixed in with something, but generally I don’t like ’em. And I’d better not see any in or on my brownies. No joke. This appeared to fit the bill when I was digging through my cookbooks. The fact that it’s also out of Cooking for Two was just the icing on the cake. That way, I didn’t have to worry about leftovers. Not many leftovers, at least, since this book is prone to being “for three”. Luckily, it actually made just enough for two this time. Probably because I used my handy-dandy secret spaghetti & linguine weapon against it. 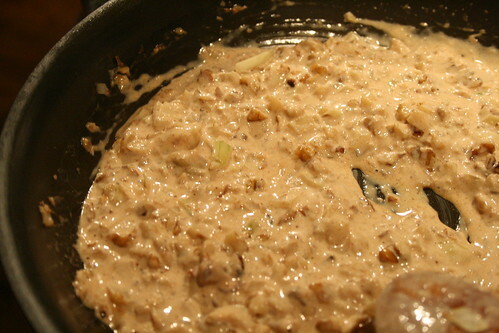 Melt the butter in a saucepan, then stir in the onions and walnuts. Medium heat is good for all of this. Cook, stirring occasionally, until the onions get all wonderfully limp & translucent, and the nuts are nicely browned. But at least until the onions are cooked. Then add the vermouth, cinnamon & nutmeg, and cook until the spices smell awesome. This’ll be maybe half a minute, at most. Add the cream, then bring everything to a simmer and cook until it’s nicely thickened (the authors say, “until it coats the back of a spoon”). Stir it frequently to avoid burning/scalding/something gross happening. Stir in the cooked linguine and the cheese and the salt. 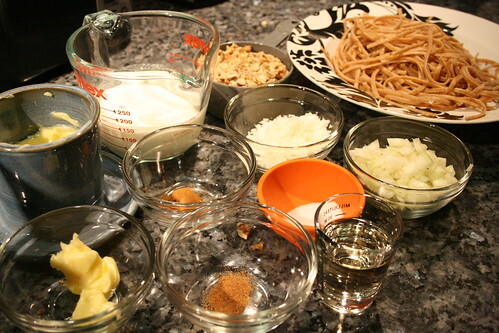 Toss to coat the linguine well and keep on the heat to melt the cheese & warm the pasta. Serve at once and say, NOMNOMNOM. I didn’t weigh my dry pasta. I have a scale, and I use it regularly, but I don’t use it to weigh pasta for two people. I use this plastic thingamabober my mother gave me back when she was cleaning out her kitchen. It’s old & plastic and has graduated holes for spaghetti. You grab a pile of long pasta and put the appropriate sized hole around the strands clenched in your fist. When they fill the hole/ring, that’s the right amount of long pasta for X people. It measures x= 1 – 4. If I knew how to code for equations in this software, I totally would have made that some sort of iterating equation there. It probably would have been mathematically wrong, but it would have looked cool. The hardest part of this recipe is also the part that makes it great. It moves FAST. I rarely cook my pasta ahead of time for meals like this, but I did this time and I am very glad I did. I’m sure I would have over reduced the sauce or burned it or something if I’d had to keep it waiting for the linguine to cook. I don’t find that the spices start to smell too strongly in this recipe, but they do tend to release some scent as they cook. Use your best judgement. Maybe my spices were just ooooooooold. I don’t think so, as I’ve started buying minute quantities from the bulk bins at Whole Foods as I need them, but it’s totally possible. I’ve no idea how old that stuff is, though. I used queso blanco because the cheese clearly needs to melt fast. I don’t know that it actually made a difference. I also used it because I never have had it before. That was cool. Then I ate a bunch of it in quesadillas. NOM. Okay, look. This is an ugly dish. It’s really not something that makes you drool to look at it. I think that goes double for me and my whole-wheat pasta. The whole dish is just brown. And, truth be told, it doesn’t taste too spectacular either. The taste does not, in fact, make up for the lack of visual appeal. I don’t mean to dog on the dish. It’s not bad. It’s quite decent, and the fact that it’s lightning fast to make really makes up for a lot of brown and a lot of “not spectacular”. They can’t all be spectacular dishes, right? That’d be review inflation, and I try to combat that as much as I tried to combat grade inflation in a past life. Sadly, a TA does not have a lot of tools to prevent grade inflation. I would definitely make this again, but I’d definitely pair it with a fun and easy salad as well. It was seriously perfect for what I needed it to do: be a fast and filling dish that I can make while distracted by cooking for the next day’s pot-luck. Actually, as I say that, I realize that this is the perfect meal for before you leave on a trip or when you’re working on Thanksgiving or anything like that. Fast, easy, decent taste and doesn’t make a lot of dishes. So, there ya go. Neither a winner or a loser. Solidly in the middle of the pack.